Heat oven to 375°F. Spray outsides of 2 (10-oz) custard cups with cooking spray. Place bottoms up on cookie sheet with sides. Place frozen biscuits on microwavable plate. Microwave uncovered on High 15 seconds; turn over, and microwave about 10 seconds longer or until biscuits are softened. Spray work surface lightly with cooking spray. On surface, press each biscuit into 5-inch round. Place 1 biscuit on outside bottom surface of each custard cup. Gently press and stretch dough about two-thirds of the way down side of each cup. Bake 14 to 16 minutes or until golden brown. Cool 5 minutes; remove baked dough from cups. Place on cooling rack, right side up; cool 15 minutes. 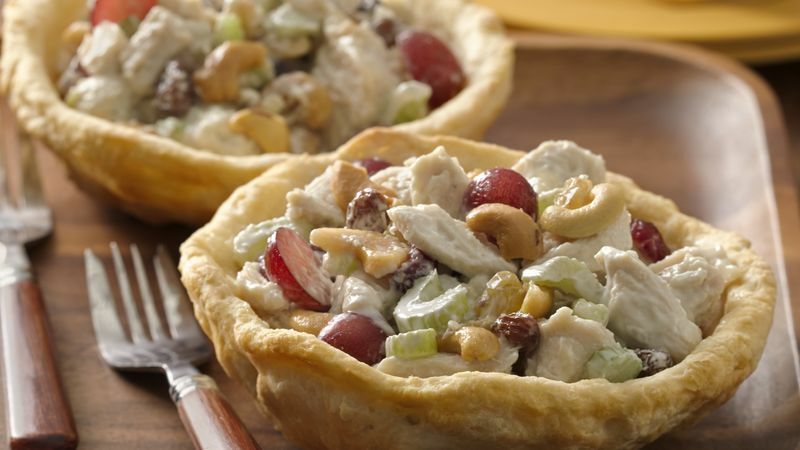 In medium bowl, mix chicken salad, grapes and 1/3 cup of the cashews. Divide mixture evenly between bread bowls; sprinkle with remaining cashews. If the deli chicken salad you purchase does not include celery, feel free to add some for a little crunch.